The results from a national poll of teens and parents conducted by Common Sense Media highlights that youth increasingly interact with friends, classmates, and people with similar interests through social networks – but parents remain largely unaware of their teen’s online activities. 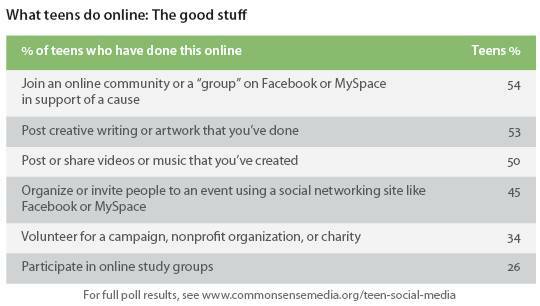 Teens are deeply involved in their social networks. Over half of all teens (51%) check their social networking sites more than once a day, and 22% of teens check their pages more than 10 times a day. In contrast, 29% of parents say their teen checks their social networking site more than once a day, and only 4% say their teen checks more than 10 times a day. Kids also put their social networking sites to great use. In addition to the opportunity to stay in touch with a broader network of friends, they support causes, share their creativity, and get involved in issues. If your kids or teens are using social networking sites, but you haven’t tried these sites out for yourself, you need to jump in. These sites aren’t ‘bad’ or ‘scary’ and you may discover you really enjoy reaching out to your own friends, family, and others that share your interests. 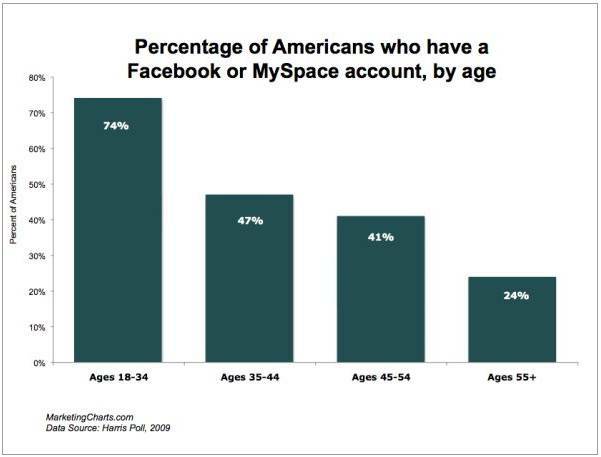 In fact, a new Harris Poll shows that 47% of Americans between 35-44 have a social networking account, as do 41% of 45-54 yr-olds, and 24% of those 55 and older! Once you’ve learned how to use social networking sites yourself, you’ll be in a much better position to have a conversation with your children about staying safe while having fun. To get started on your safety conversation, check out the Safety Guides on www.ilookbothways.com and search the site for more information on particular topics. This entry was posted on Monday, August 10th, 2009 at 12:50 pm and is filed under In The News. You can follow any responses to this entry through the RSS 2.0 feed. Both comments and pings are currently closed.